Our newest product is part of our Industrial line-up: products that focus on keeping workers safe and enhancing performance on job sites. 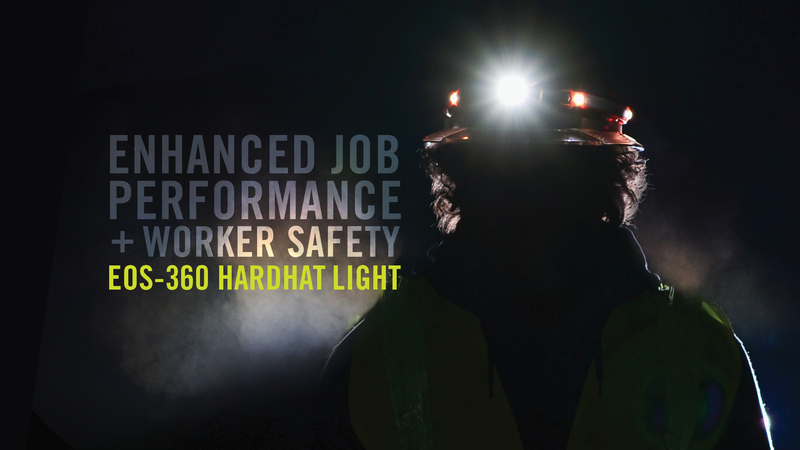 The EOS-360 hardhat light has a very recognizable main component: our EOS headlamp. The EOS-360 improves upon our best-selling EOS, connecting it to a durable, rubberized hardhat band comprised of LEDs and reflective strips. A slip resistant design keeps the EOS-360’s LED band in place on both standard and wide brim hardhats. The LED band includes constant on and safety flash modes, set bright enough to draw attention, but not so overwhelmingly bright that it negatively impacts professionals working in the immediate area. The EOS headlamp comes standard with spot high, low and strobe modes. The EOS headlamp and the LED band function independently from one another, allowing workers to choose and easily switch between which combination of task lighting and safety lighting they need in various situations. Want to check out for yourself? Interested in full specs on the EOS-360?